Andrew Macredie (1823-1907) was a Scottish colonial pastoralist, as well as a cartoonist and illustrator. He came to Victoria in 1848, and in 1855 joined his brother, Robert, in managing the pastoral run of Banyenong, on the banks of the Avon River. Originally settled by the Donald family in 1844, after which the nearby town of Donald was named, the station was a social centre for settlers on the Richardson River in the 1860s. 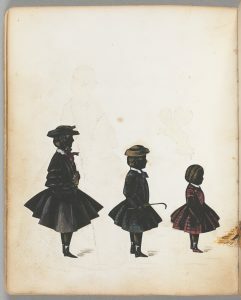 It was at this time that Macredie produced the two volumes of silhouettes that the Manuscripts Collection of the State Library is fortunate to hold. 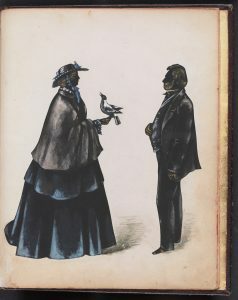 In 1854 Macredie produced the first volume – He Presents his Book of Beauty to Ye Queen Yerof – and the second volume – Here We Are Again – followed in 1862. The silhouettes depict Macredie’s friends and neighbours in Banyenong, including local pastoralists and their wives (77 people are depicted in a total of 69 plates). Many of the works have the names of the sitters on the back, and some also include quotes. 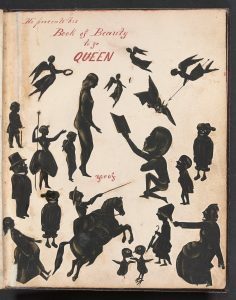 The silhouettes are cut from black paper; some are highlighted with white, gold or cream watercolour. The figures are then pasted onto light coloured paper, so appear dark against light. 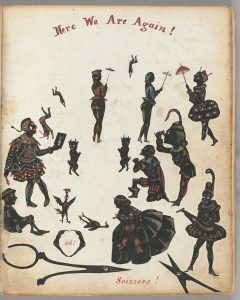 Often single figures were depicted, but also ‘conversation piece’ silhouettes, which showed groups of people interacting with each other. Silhouettes were very popular from the mid-18th century, and were a cheaper alternative to miniature portraits created by painters. In fact, the origins of the term ‘silhouette’ comes from the French government official Etienne de Silhouette, who was responsible for massive spending cuts in the mid-1700s; the term ‘silhouette’ became synonymous with ‘cheap’. Sometimes referred to as ‘shadow portraits’ or ‘scissor portraits’, the portraits were cut by hand, while the sitter posed in profile. Very experienced silhouettes artists created these small works ‘live’, and in a matter of minutes. Though very popular in pre-camera times, the art did not quite disappear when photography began to dominate the world of portraiture in the mid-19th century. This was mainly due to two reasons: Firstly, the silhouettes by Macredie are from a time when photography was in its infancy. The complex technologies of early photographic processes like daguerreotypes and calotypes meant that few photographers travelled to remote country settlements to take portrait photographs. Photographers operating at the time would have done so from studios in cites or larger towns. Above: One of Macredie’s subjects, John Hunter Kerr, whose portrait appears in Volume 2, p.13 (plate 5), was an amateur photographer who lived in the area, though there no known photographs by him of his friends and neighbours. 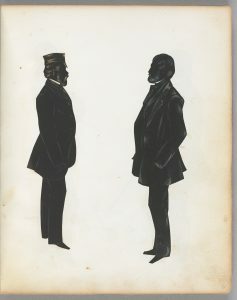 And secondly, silhouettes had an extra, more mysterious appeal; people of the time thought that the physiology that was distilled and presented in the blacked-out profile was very revealing of a person’s moral and intellectual makeup. Both volumes in the Library’s collection have been fully digitised, and are viewable online. Gregory LeFever, “Faces in Black and White”, Early American Life, June 2009, pp. 60-69. Madeleine Say, “John Hunter Kerr: Photographer“, La Trobe Journal, no. 76, Spring 2005, pp. 71-76. Thanks for your very interesting comment. There is certainly an aesthetic in the art of silhouettes that contemporary artists can (and do) respond to! Beautiful! Brings to mind a workshop on shadow puppetry that The Ian Potter Museum down the road is running as as part of their exhibition: All the Better to See You! 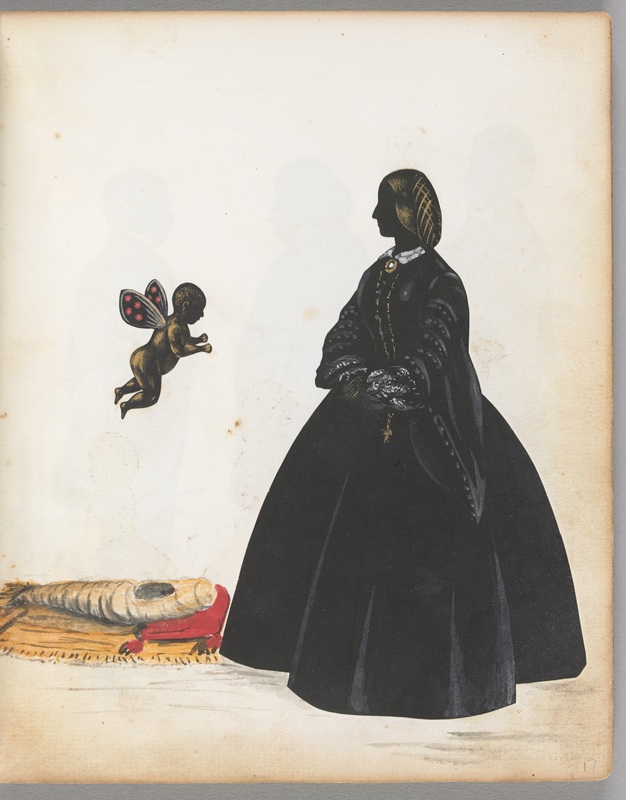 I love the image of Mary Anne Donald and her children – including the little dead baby flying out of its swaddling clothes on wings! The Art Gallery of Ballarat has a series of anonymous 1859 watercolour views of homesteads in the Richardson River district – including William Donald’s Banyenong East and Andrew Macredie’s Banyenong West. They are going to be on display in an exhibition called ‘In occupation’, until 27 May 2018, and the relevant silhouette portraits, relating to the different squatters, will appear on the text panels. It’s amazing that there are silhouettes for all the pastoralists except one. Thank you for your comment Peter! How wonderful that the Art Gallery of Ballarat will use the silhouettes in such an informative and creative way. And regarding the image of Mary Anne Donald and her children, it’s a personal favourite of mine too, though I’m interested in your interpretation of the flying baby as dead; I saw it as a depiction of birth (another child!) via the pupa/butterfly metaphor. No wrong or right, I think. I look forward to seeing the exhibition. Olga, you could well be right about the baby – the genealogical records for the Donald family support it being a living child. In that case, the baby is heading down into the bundle of cloth rather than up to heaven. Is that how they explained to the other children the sudden appearance of a new baby – a nineteenth-century version of babies from the cabbage patch! It would be interesting to compare with other Victorian depictions of flying babies. Yes! Sounds like a great research topic!